➢ “It feels like 2018 is just about the perfect time for a show that features a black, lesbian superhero. Sure, in the pilot of Black Lightning — created by Mara Brock Akil (Girlfriends) and husband Salim Akil and produced by Arrowverse mastermind Greg Berlanti — Anissa Pierce (Nafessa Williams) isn’t quite a superhero yet, and her queerness isn’t made explicit (but not to worry — Williams has confirmed it on Twitter! ), but the entire show crackles with potential energy, as electric as the abilities of her dad Jefferson Pierce (Cress Williams), the titular Black Lightning who, after retiring to become a high school principal, reluctantly reclaims his superhero mantel in order to protect his daughters, Anissa and Jennifer (China Anne McClain), from the sinister One Hundred gang terrorising their neighbourhood.” — Entertainment Weekly. ➢ “By the second episode, Black Lightning falls back on the soapier character drama that keeps the show humming along, with just enough cheese- and/or beefcake to remind you you’re watching a show for teens. But overall the show is an object lesson in how to revive what is otherwise a tiresomely ubiquitous format — the superhero show — by finding a new entry point for its drama.” — Variety. ➢ “In familiar comic book fashion, the first season of Black Lightning is set up as the battle for the heart of a city, and like Netflix’s Luke Cage, the use of a predominantly African-American urban space for commentary on gentrification, community organising and tense relationships between law enforcement and civilians. The series is driven by some solid action scenes, a bass-pumping soundtrack, stylish treatment of Black Lightning’s sizzling powers and character pragmatism.” — The Hollywood Reporter. ➢ “Part of the fun in watching this socially relevant, sci-fi hybrid comes from seeing Williams zap boys half his age, sending them tumbling down stairwells, slamming into walls and, in one case, crashing through a car windshield from midair. Costume designer Laura Jean Johnson has given Williams an imposing costume of black rubber, with twin white lightning bolts breaking across his massive chest. The overall effect completes his transformation from earnest, conservatively dressed high school do-gooder to rule-breaking, buff badass.” — New York Post. ➢ “Black Lightning is immersively, not incidentally, black: The good guys and bad guys, teachers and students, victims and criminals and reporters are mainly African-American. Luke Cage and Marvel’s Runaways have diversified the comics-TV lineup. 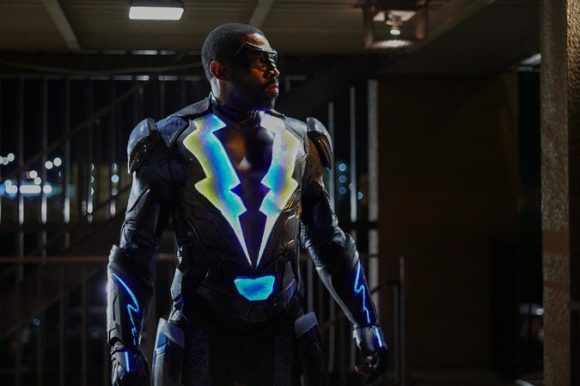 This show’s race-forward sensibility and its older protagonist, conflicted about getting back into the game, give Black Lightning its spark.” — New York Times. Interested in the distribution of this one. According to IMDB this is a Netflix original outside of the US. And given its a Berlanti product where it sits in NZ given the Sky TV – Berlanti/DC/WB connections on the other DC universe properties. Mental lapse, I’m afraid — it is a Netflix property, not Amazon, in this market. Re CW content: Netflix has done a deal with CW to distribute some of its key titles internationally. Is it because it falls outside of the Arrowverse (although crossovers havent been completely ruled out)? All the other Arrowverse series appear on The CW and yet here is an exception for the NZ rights? Or did the DCE-Netflix deal mean that all the new DCE content will go first-run exclusive internationally on Netflix? Hard to keep up with but if there are universe-crossovers it’s going to be galling to have to subscribe to two services to watch. I was asking Sky for this show and they say nothing planned … so I thought no one in NZ has it.